There are 5 reviews of El Cosmico. El Cosmico is D.S.& Durga's interpretation of the atmosphere and evening air at the namesake Marfa Texas hotel and campsite that resides on the wild edge between civilization and the high plains desert. This same aroma is found in many of the desert southwest communities when the sun goes down as piñon and dried mesquite smoke fills the cool night air with cleansing smokey resin drifting from campfire and kiva with a smudge of shamanic essence. El Cosmico smells smokey and dusty with resinous bold notes from piñon, khella and creosote. The appeal of a fragrance like this is not its beauty, but that it transports you to a specific time and place that has a not so familiar and wild adventurous spirit. Many of D.S. Durga fragrances have this same outdoor spirit, but most are easier to wear than this one. El Cosmico is a wild gnarly aroma of piñon pine and burnt creosote. I like the imagery and creativity of this fragrance but I won't wear it because its abrasive character is just slightly off the mark for me. There's something unspeakably awful going on with this fragrance. It reminds me of a durian, which is a particularly noxious fruit I had at an Indonesian restaurant once. I've sampled a lot of fragrances in the past few years and this one of the only ones that is almost as sickening as Secretions Magnifiques. It is long lasting and seems to have good sillage for anyone who likes the scent, but it conjures up horrible images for both me and my partner. Burnt engines with something sickly sweet, eerie, and wrong. I've wanted to try a sample of El Cosmico for some time. It's finally been released as a standard issue by DS & Durga, and I'm really glad I got ahold of some. Fabulous green desert accords in this one. The Pinyon Pine is my favorite note, but the shrubbery is also excellent. The creosote note is spot on and is quite strong in the overall blend. This is very much like being in a high desert setting...in fact if you close your eyes while wearing it, you can imagine you're there. One thing that was surprising is that there was a moment during the wear that I was reminded of Heeley's Cardinal. Obviously these scents are different, but there is an accord that has a likeness in the two as well. I love both of them, so that's a good thing in my book. A big thumbs up for El Cosmico! This is an excellent fragrance and very transportive. D.S. & Durga El Cosmico purports to evoke a dry woody desert, and in this respect I find it to be quite successful. It entails the woody notes of oak and pine but without their lively fullness. Additional contributors that add a certain spikiness are pepper and creosote. Pepper provides conventional spiciness but creosote is an odd, almost synthetic-smelling note that is almost dirty in its smokiness. Very odd stuff that I've only seen used a few times, in my estimation. The projection of El Cosmico is pretty boastful to start and longevity seems to be quite good as well. This is mainly a cold-weather scent for men but can really be used as liberally and by whomever sees it fit. I rejects being taxonomized in a traditional area, so it gets a nod of versatility above the burnt but more woody-heavy entries like Dasein Winter Nights or La Curie Incendo, which lend themselves pretty much exclusively to cold weather wearing. I want to like El Cosmico more and I daresay that I'm close to that, but it just doesn't draw me in quite that much. For anyone who wants to smell like the woods outside Santa Fe, this is your jam. I want to smell like the woods outside Santa Fe, so this is my jam. D.S. 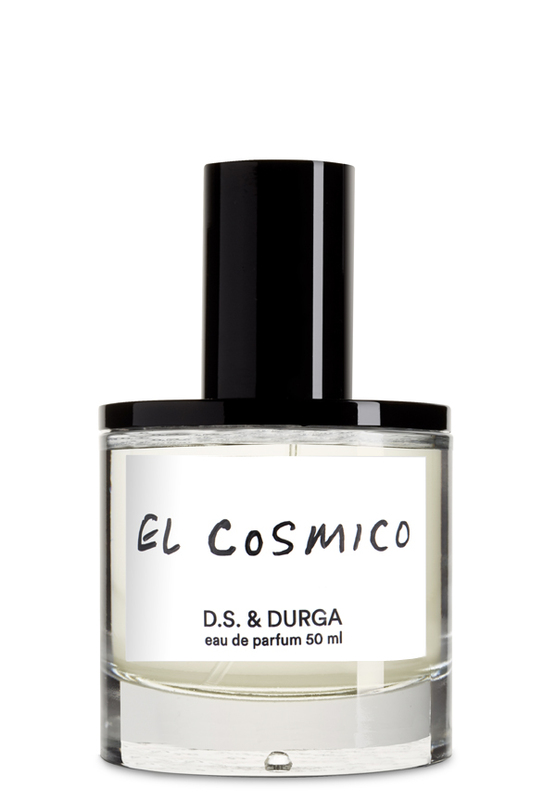 & Durga El Cosmico Eau De Parfum 5 ml Glass Purse Spray NICHE! There are no member images of El Cosmico yet. Why not be the first?